Details Titanium dioxide pigment is a fine white powder. 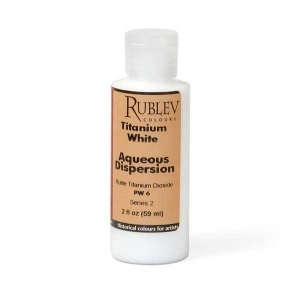 When used in paints, it provides for maximum whiteness and opacity. It gives paint high hiding power, meaning the ability to mask or hide the substrate underneath. It does this more effectively than any other white pigment. 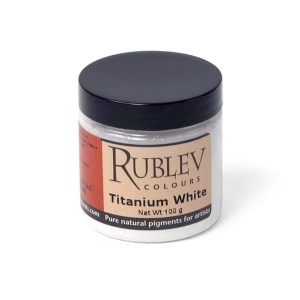 Today, titanium dioxide pigment is by far the most important material used by the paints industry for whiteness and opacity. These unique properties are derived from the refractive index of titanium dioxide. The refractive index expresses the ability to bend and scatter light. Titanium dioxide has the highest refractive index of any material known to man, greater even than diamond. To take advantage of this property, titanium dioxide must be mined, refined and ground to a fine, uniform particle size. Titanium dioxide white pigments are developments of the 20th century, and because of their high hiding power, low toxicity and reasonable cost, they have eclipsed other traditional white pigments. Titanium dioxide can refer to any pigment containing a compound of titanium. The name "Permanent White" has been applied to many pigments, including titanium dioxide whites. Such imprecise names can cause confusion and many are still used today. At the beginning of the 20th century development of titanium dioxide white pigment occurred simultaneously in Norway and the United States. Several processes were later developed and patented by companies in both countries. Use of titanium dioxide as a white pigment in artist's palettes began in field tests as early as 1916, but it wasn't until the 1940's that widespread use of the pigment began. Nature does not yield titanium dioxide in a form that is usable as a pigment. Titanium dioxide is usually associated with iron, mostly as the mineral ilmenite. It is also mined in one of the pure forms, rutile beach sand. Deposits of titanium-bearing minerals used as the basic raw materials in the manufacture of titanium dioxide pigments can be found in many places on the earth. Pigment manufacturers convert these raw materials to produce titanium dioxide pigments. The production of titanium dioxide pigments is basically a refinement process. This may be achieved by either the sulfate process, which uses sulfuric acid as a separating agent, or the chloride process, which works with chlorine. Once refined and developed to the appropriate particle size, the pigment may be surface treated with inorganic oxides and an organic compound to achieve better technical performance, such as easy processability or higher weather durability. Both rutile and anatase forms of titanium dioxide white are lightfast. However, according to Marilyn Laver, exposure to light can cause a phototropic color change under certain circumstances. Rutile undergoes this reversible color change to a lesser extent than does anatase. The rutile and anatase pigment forms are both chemically inert, and do not react with airborne pollutants, organic solvents and other pigments. Increased weather resistance and dispersibility of titanium dioxide pigments are provided by coating the pigment with inorganic or organic substances. 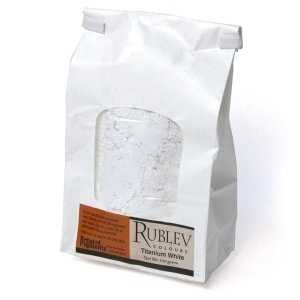 Our grade of titanium dioxide is coated with alumina, silica and zirconia compounds. Some suggest that the resistance of titanium dioxide pigments to acids and alkalies is an advantage for their use in true fresco. Titanium dioxide absorbs a low amount of oil. The oil absorption ratio is 15–20 parts by weight of oil to 100 parts by weight of pigment. If the measurement were grams, it would require 15 to 20 grams (by weight) of linseed oil to grind 100 grams (by weight) of pigment to form a stiff paste. It makes an average drying oil paint that forms a soft, brittle film. Titanium dioxide pigments have been produced and processed for nearly a century and no acute or chronic harmful effects attributable to titanium dioxide have become known. Titanium dioxide is not considered to be hazardous, but care should be used in handling the dry powder pigment to avoid inhaling the dust. The Occupational Exposure Standards (OES) for titanium dioxide in the air at the workplace have been set at 3 mg/m3 total respirable dust. Titanium dioxide is not expected to have any mutagenic, carcinogenic, fibrogenic, toxic or allergenic effects if this value is adhered to. 1. The classification A1, A2, R1, R2, R3 corresponds to DIN EN ISO 591, Part 1. 2. The titanium dioxide content and density of the pigments depend on the type and quantity of the treatment substances used to improve the application properties. Pure rutile has a density of 4.2, while pure anatase has a density of 3.8. 3. The relative scattering power is the decisive parameter for the tinting strength and hiding power of titanium dioxide pigments. Determination of the scattering power to DIN 53165 is part of quality control at all our plants. An internal standard is used as the reference pigment.